Centre for Environment & Socio-Economic Research Publications™ was established in 1999 as a scholarly publisher. From that beginning, Centre for Environment & Socio-Economic Research Publications™ has been dedicated to the advancement and dissemination of knowledge to scholars, students, the scientific and academic societies. Centre for Environment & Socio-Economic Research Publications™ is rapidly growing, subscription based, scholarly publisher of academic and scientific peer-reviewed journals, conference proceedings and digital books in the area of science, engineering and technology. The Journals of Centre for Environment & Socio-Economic Research Publications™ are indexed by all major international agencies like Web of Science [Database: Emerging Sources Citation Index], Zentralblatt MATH (ZentralblattfürMathematik), SCOPUS (Elsevier Bibliographic Databases); Statistical Theory and Method Abstracts (STMA-Z), getCITED, Newjour, Current Index to Statistics (CIS), SCImago Journal & Country Rank, IndexCopernicus, International Statistical Institute (ISI, Netherlands) Journal Index, Academic keys, Ulrich's Periodicals Directory, Indian Science Abstracts, JournalSeek and others. 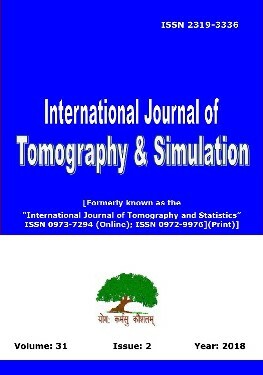 The main aim of the International Journal of Tomography and Simulation™ (ISSN 2319-3336) [Formerly known as the “International Journal of Tomography and Statistics” ISSN 0973-7294 (Online); ISSN 0972-9976 (Print)] is to publish refereed, well-written original research articles, and studies that describe the latest research and developments in Computerized Tomography and Simulation. It also covers the many potential applications and connections to other areas of Science and technology. 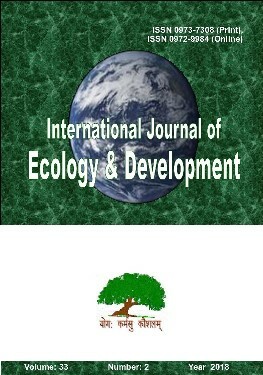 The main aim of the International Journal of Ecology & Development™ [ISSN 0972-9984 (Print); ISSN 0973-7308 (Online)] is to publish refereed, well-written original research articles, and studies that describe the latest research and developments in ecology and development. It also covers the many potential applications and connections to other areas of Ecological Science, economics and technology such as the use and development of mathematics/ statistics in ecology or use and development of economics for ecology & development or inter-disciplinary nature of applications for Ecology & Development. IJED is published four issues in a year. Reviewed, Abstracted and Indexed: The IJED is reviewed, abstracted and indexed by the Thomson Reuters Web of Science [Database: Emerging Sources Citation Index], ERIH PLUS [European Reference Index for the Humanities and the Social Sciences], Newjour, JournalSeek, Getcited, Ulrich's Periodicals Directory, and Mathface Index, Current Index to Statistics (CIS), SCImago Journal & Country Rank, IndexCopernicus, International Statistical Institute (ISI, Netherlands) Journal Index, Academic keys, Ulrich's Periodicals Directory, Indian Science Abstracts, JournalSeek. 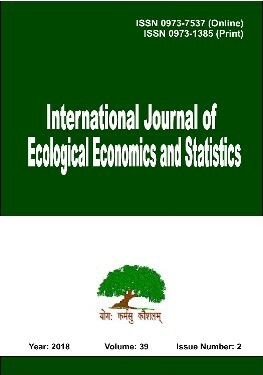 The main aim of the International Journal of Ecological Economics and Statistics™ [ISSN 0973-1385 (Print); 0973-7537 (Online)] publishes refereed, well-written original research articles, and studies that describe the latest research and developments in ecological economics and ecological statistics. International Journal of Ecological Economics and Statistics™ (IJEES) is an interdisciplinary research journal in the area of environmental economics & environmental statistics. It's covers the many potential applications and connections to other areas of Science and technology such as the use and development of mathematical/ statistical modeling. IJEES is published four issues in a year. International Journal of Statistics and Economics™ (ISSN 0975-556X), formerly known as the “Bulletin of Statistics & Economics” (ISSN 0973-7022), publishes papers in all areas of Statistics and Economics, emphasis is placed on the practical importance, theoretical interest and policy-relevance of their substantive results, as well as on the methodology and technical competence of the research. More general papers in statistics, probability, mathematical economics, microeconomic, macroeconomic, forecasting, business econometrics, computation, simulation, or graphics are also appropriate if they are immediately applicable to the journal's general topics of interest. Articles published in IJSE contain significant results, high-quality methodological content, excellent exposition, and usually include a substantive empirical application. 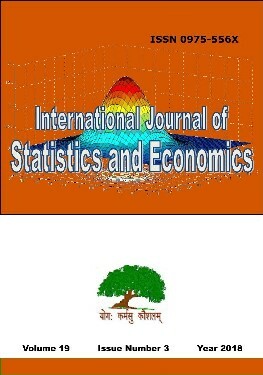 “International Journal of Statistics & Economics” is reviewed by, and abstracted and indexed in EconLit, Journal of Economic Literature (American Economic Association),Mathematical Reviews,(American Mathematical Society),Current Index to Statistics (CIS)[ The Current Index to Statistics (CIS) is a joint venture of the American Statistical Association & Institute of Mathematical Statistics, USA], JournalSeek, Getcited, Mathface Index, Zentralblatt MATH (European Mathematical Society) MathSciNet, Indian Science Abstracts, International Statistical Institute (ISI, Netherlands) Journal Index, Academic keys, Ulrich's Periodicals Directory, IndexCopernicus. 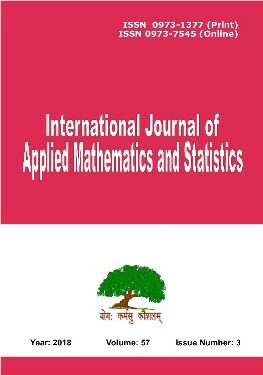 The main aim of the International Journal of Mathematics and Computation™ [ISSN 0974-570X (Online); 0974-5718 (Print)] is to publish refereed, well-written original research articles, and studies that describe the latest research and developments in the area of mathematics and computations. This is a broad-based journal covering all branches of mathematics, computations and interdisciplinary research. 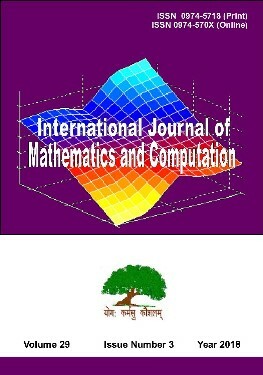 International Journal of Mathematics & Computation (IJMC) is a peer-reviewed journal and published four times (quarterly) in a year. The main aim of the International Journal of Mathematics and Statistics™ [ISSN 0974-7117 (Print), ISSN 0973-8347 (Online)] is to publish refereed, well-written original research articles, and studies that describe the latest research and developments in the area of mathematics and statistics. This is a broad-based journal covering all branches of mathematics, statistics and interdisciplinary research. 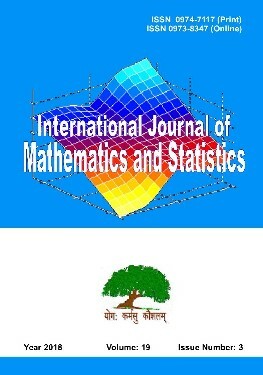 International Journal of Mathematics & Statistics is a peer-reviewed online journal and is published Three times a year. The main aim of the International Journal of Artificial Intelligence™(ISSN 0974-0635)is to publish refereed, well-written original research articles, and studies that describe the latest research and developments in the area of Artificial Intelligence. This is a broad-based journal covering all branches of Artificial Intelligence and its application in the following topics: Technology & Computing; Fuzzy Logic; Neural Networks; Reasoning and Evolution; Automatic Control; Mechatronics; Robotics; Parallel Processing; Programming Languages; Software & Hardware Architectures; CAD Design & Testing; Web Intelligence Applications; Computer Vision and Speech Understanding; Multimedia & Cognitive Informatics, Data Miningand Machine Learning Tools, Heuristic and AI Planning Strategies and Tools, Computational Theories of Learning; Signal, Image & Speech Processing; Intelligent System Architectures; Knowledge Representation; Bioinformatics; Natural Language Processing; Mathematics & Physics. 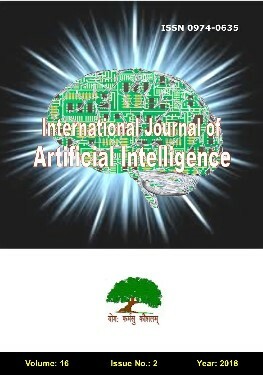 TheInternational Journal of Artificial Intelligence (IJAI)is a peer-reviewed online journal and is published inSpringandAutumni.e. two times in a year. TheInternational Journal of Artificial Intelligence(ISSN 0974-0635) is reviewed, abstracted and indexed by the INSPEC The IET, SCOPUS (Elsevier Bibliographic Databases), Zentralblatt MATH (io-port.net)of European Mathematical Society,Indian Science Abstracts,getCITED,SCImago Journal & Country Rank,Newjour, JournalSeek, Math-jobs.com’s Journal Index,Academic keys, Ulrich's Periodicals Directory, IndexCopernicus, andInternational Statistical Institute(ISI, Netherlands)Journal Index. TheIJAIis already in request process to get reviewed, abstracted and indexed by the Clarivate Analytics Web of Science (Also known as Thomson ISI Web of Knowledge SCI), Mathematical Reviews and MathSciNetof American Mathematical Society, and by other agencies. The main aim of the International Journal of Imaging and Robotics™ (ISSN 2231-525X) [formerly known as the "International Journal of Imaging" (ISSN 0974-0627)] is to publish refereed, well-written original research articles, and studies that describe the latest research and developments in the area of and robotics. This is a broad-based journal covering all branches of imaging and robotics. 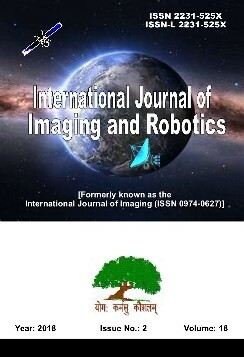 The International Journal of Imaging and Robotics (IJIR) is reviewed, abstracted and indexed by the IndexCopernicus, Indian Science Abstracts, getCITED, Newjour, JournalSeek, Math-jobs.com’s Journal Index, Academic keys, Ulrich's Periodicals Directory, IndexCopernicus, and International Statistical Institute (ISI, Netherlands) Journal Index. The IJIR is already in request process to get reviewed, abstracted and indexed by the Thomson ISI Web of Knowledge SCI, Mathematical Reviews and MathSciNet of American Mathematical Society, and by other agencies. The main aim of the International Journal of Engineering and Future Technology™ [ISSN 2455-6432] is to publish refereed, well-written original research articles, and studies that describe the latest research and developments in the area of Engineering and Future Technology. This is a broad-based journal covering all area of areas of Engineering and Future Technology like Aerospace Engineering, Automobile Engineering, Applied Mathematics, Applied Physics, Bioinformatics, Biophysics, Biotechnology, Chemical Engineering, Chemical Physics, Civil Engineering, Computational Physics, Computer Engineering, Electrical Engineering, Electronic Engineering, Energy Engineering, Environment Engineering, Information Technology, Marine engineering, Mechanical engineering, Medical Engineering, Medical imaging, Medical Physics, Nanotechnology, Ocean Engineering, Optical engineering, Photonics, Robotics, Urban Engineering and so on. 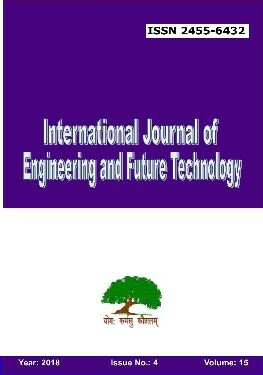 International Journal of Engineering and Future Technology™ is a peer-reviewed journal and published two issues in a year.